Chest pain often signals an underlying heart problem. Find out what the different types of chest pains could mean from the Department of Cardiology, National Heart Centre Singapore (NHCS). could indicate anything from indigestion to a more serious heart condition like an impending heart attack. Don’t ignore the chest pain that suddenly hits you while at rest or during walking or exercising. The sensation of squeezing, crushing or pressure on the chest could indicate many things – from “harmless” stress and indigestion to something as serious as an impending heart attack or angina. 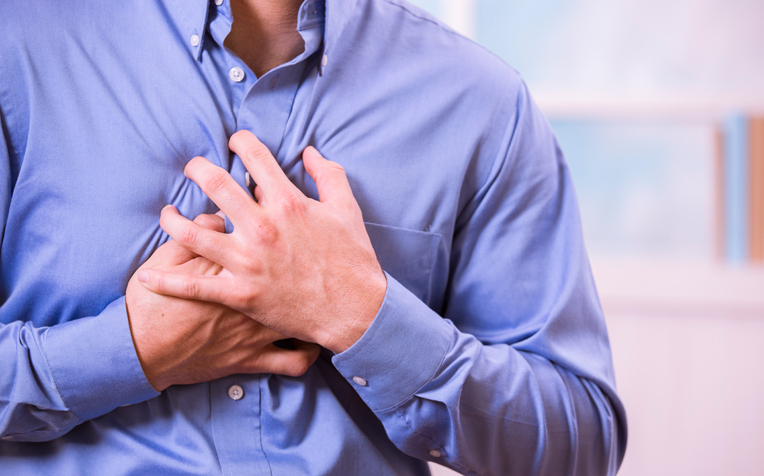 Angina is recurring chest pain that usually signals coronary artery disease. “Please seek emergency assistance if the chest pain lasts more than 15-20 minutes at rest or if it is accompanied by nausea, sweating, shortness of breath or loss of consciousness”, says Dr Aaron Wong, Head and Senior Consultant, Department of Cardiology, and Director, Interventional Cardiology, National Heart Centre Singapore (NHCS), a member of the SingHealth group. It is sometimes difficult to determine the cause of the chest pain, but in some higher risk patients, unexplained, sudden chest pains often indicate underlying heart problems, Dr Wong adds. Angina is chest pain that arises from beneath the sternum and is caused by reduced blood flow to the heart due to blockages in the main coronary arteries. Angina pain is usually a warning sign of coronary artery disease. Triggers include emotional stress, strenuous exercise and heavy lifting. Angina varies in severity, depending on the type of angina pain. The most common angina pain – stable angina – lasts only a few minutes and occurs predictably during physical exertion such as climbing the stairs, or during mental or emotional stress. Symptoms disappear immediately with rest or medication. It does not indicate an impending heart attack. Unstable angina is more serious than stable angina and it can occur even at rest. The chest pain could last as long as 30 minutes and does not go away with rest or medication. It may progress to a heart attack when complete blockage of the coronary artery occurs. New onset stable angina or increasing frequency of stable angina, especially with lesser exertion, is also classified as unstable angina. Unstable angina signifies sudden progression of blockage of the artery due to breakage at the narrowing (rupture plaque) leading to clot formation (thrombosis). Variant angina is caused by sudden spasms in the coronary arteries which restrict blood flow to the heart. Chest pains are severe and happen at rest. It is usually resolved spontaneously but if the spasms are not controlled, it could lead to a heart attack. Medication can bring immediate relief. Chest pains associated with an impending heart attack are more intense than angina pain and last longer than 15 minutes. Rest cannot bring relief. Chest wall pain is generally harmless and felt as sharp pain or tenderness in the bones, cartilage or muscles that make up the chest wall. Possible causes include: Injury, prolonged coughing, strained chest muscles, cartilage inflammation of the rib cage (costochondritis) and pain caused by the gastrointestinal tract (e.g. gastroesophageal reflux or peptic ulcer disease). A blood clot in a lung artery – a condition called pulmonary embolism – could also cause sudden, sharp chest pains. This is associated with immobilisation of the legs for a long time, e.g. long distance travel in a coach or plane. Clots form in the veins of the leg and are dislodged into the arteries of the lungs. This condition reduces blood flow to the lungs and therefore oxygenation of the blood. The chest pains are often accompanied by breathlessness and a fast heartbeat. The pain worsens when you cough or take deep breaths. Pulmonary embolism is a medical emergency. This is due to splitting of the layer of the wall (dissection) of the aorta, the main artery in the body and is usually related to very high blood pressure. The pain is usually described as a tearing pain in the chest, radiating to the back. The dissection may extend into the origin of the aorta and block off one or more of the coronary arteries, leading to a heart attack. Aortic dissection is also a medical emergency. “Chest pains have many underlying causes. Treat any sudden, severe and recurring chest pains not relieved by rest as a medical emergency,” Dr Wong advises.